Until recently, a good-quality makeup brush was enough to create a nice makeup. Nowadays, a traditional flat-top brush is being replaced with a makeup sponge. Of course, the most popular one is the Beauty Blender. Do you know how to use it properly? The originator of using a simple egg-shaped sponge to do makeup is a Hollywood makeup artist – Rea Ann. The pink Beauty Blender sponge has taken over the world of makeup and today, almost every woman cannot imagine her makeup without using it. There will always be a group of traditionalists who prefer using a classical brush or just own fingertips to apply the foundation. Of course, these are equally good methods for which the BeautyBlender sponge is a great alternative. Whether you use a brush or a sponge is a matter of your personal choice. You decide what type of cosmetic application is the most convenient and gives the best results. Beaty Blender is a makeup sponge made of a soft and very elastic material. It is hypoallergenic, does not contain latex and is fragrance-free. Classic Beauty Blender – pink in colour, 5.5 × 3.5 cm, for applying the foundation. BeautyBluscher – gray, smaller, designed for blushes in the form of a cream. BeautyBlender Micro.Mini – a miniature of the classic version, for precise makeup application. White BeautyBlender – for applying creams, serums and, care products. Black BeautyBlender – for applying self-tanner. Blotterazzi sponge – replacement for mattifying, blotting papers, to collect excess sebum. Very ergonomic, oval and slightly pointed shape. A unique foam-like material that does not absorb cosmetics. Ideal for applying foundation, concealer, highlighter, and a blush. It is suitable to apply any type of cream products. Its entire surface is a stamping surface. It gives the effect of a uniform seamless complexion with impeccably flawless coverage. What’s interesting is the fact that the original Beauty Blender has been created to apply the foundation much quicker and in a more convenient way. At first, it’s been used just for that particular purpose. Today, we know that the pointed tip allows for precise application of every creamy cosmetic – ranging from concealers, blushers, bronzers, highlighters and even including a face cream. Due to the fact that the Beauty Blender distributes various products so well, it is considered to be a multi-purpose makeup tool. What does it mean? It is a brief description of how the Beauty Blender works. Three words suffice to explain how this tool is supposed to be used but for those who wish to go into more detail, a more precise description is to be found below. How to use the Beauty Blender? Moisten the sponge with lukewarm water. 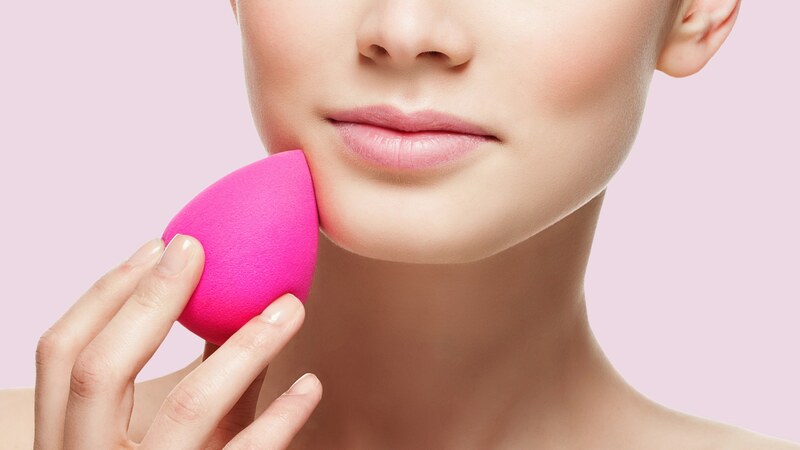 Dab the sponge into the makeup & Bounce the Beauty Blender over your face. It is worth remembering that no cosmetics should be applied directly to the sponge. The producer recommends applying the cosmetic to the face (a few drops in key-areas will suffice) and then, start distributing it around the face by dabbing it. This way, you will use less product, cover the entire face evenly. Also, it is less probable that the sponge will ‘drink up’ the product which would make washing it a bit more difficult. Since the issue of washing the sponge has already been mentioned, it is definitely worth explaining how to do it correctly. Bear in mind that this sponge is a reusable makeup tool and thus, it requires special care to maintain its qualities and proper shape. How to wash the Beauty Blender? It is done differently than in the case of brushes, where you have to be careful not to tear out the bristles. A sponge is definitely easier to wash and probably also thanks to this feature, more willingly chosen by women. Hands down, We all like easy solutions. First of all, the washing of a Beauty Blender washing should be as frequent as we do the makeup which means that the sponge should be washed each time after applying makeup. Only this way it will maintain its qualities and be suitable for use for about 3-4 months, as guaranteed by the manufacturer. It is also recommended using a special Solid soap or BeautyBlender liquid. If a separate soap is an unnecessary expense for you, of course, you can go ahead and wash the Beauty Blender with an ordinary antibacterial soap. How to do it? Moisten the sponge in warm water with the addition of soap and wash it gently. Once the cosmetic is out, give it a rinse in clean water. Next, squeeze it to get rid of excess water and put aside in a ventilated place to let it air-dry. The Beauty Blender cannot be dried on or near the radiator, or in a highly sunny place!